Apply here to attend an audition. You will receive an email to confirm your audition time by 3 pm on Tuesday, April 2, 2019. 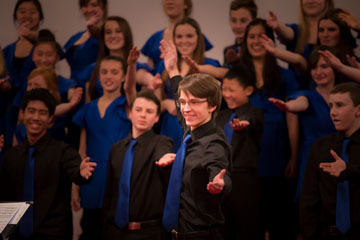 District Honour Choir is a mixed and treble choir course that offers an opportunity to challenge and extend the learning of West Vancouver Schools’ finest young singers in Grades 8-12. The course provides the potential for up to 5 years of credited music elective towards graduation. The course is held on Tuesday evenings at West Vancouver Secondary School (South Campus, Room 64). The treble choir meets from 5:00-6:30pm. 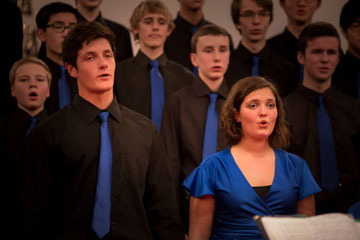 The mixed choir meets from 7:00-8:30 pm. The first Tuesday of every month there will be a mandatory musicianship session (ear training) for 20 minutes prior to the start of the class. In addition to meeting the pre-requisites for the course, all students will be required to audition in the Spring. Students do not need to prepare a song for the auditions. They will be taken through a variety of vocal exercises to assess concepts such as vocal range, pitch accuracy, and tone quality. Additionally, students will be required to pass a basic music theory test (naming notes in the treble clef, naming the basic rhythmic values of notes, and knowing basic dynamic/articulation marks). Candidates are selected mostly on the basis of their musical potential and apparent desire to work hard and make music at the highest level possible. If needed, additional times will be added the following week. This group will travel each year (either locally or abroad) to attend festivals, workshops and performances. The cost for our annual trip (anywhere from $250-$5000, depending on our destination) is in addition to the $200 course fee. Download the Honour Choir Flyer for more information here. Contact program director, Mrs. Suzanne Fulton, for more information at sfulton@wvschools.ca. Choir teacher Suzanne Fulton coordinated the Sing Project, involving more than 550 choir students from across the district. School choir teachers were also involved, preparing each school’s choir for the big event. 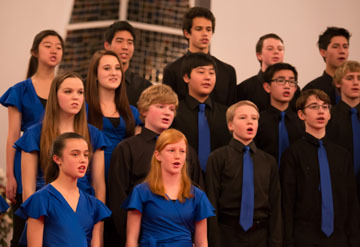 The students performed the song ‘Sing’ by vocal group Pentatonix. Grade 12 videographer Owen Shields produced this video of the event, recorded in November, 2016.